Tips on Finding and Managing GPS Software Servcies. Business Insights: GPS Fleet Tracking. Why consider GPS Fleet Tracking for Your Business. 800 Gallons: The amount of fuel the average truck idles away per year. 70 miles per hour: The sustained speed at which the tire wear will nearly double. 25 Miles: 1 Hour of idle time equals how many miles of driving. 1.5%: Increased fuel consumption for each mile over 50 MPH. 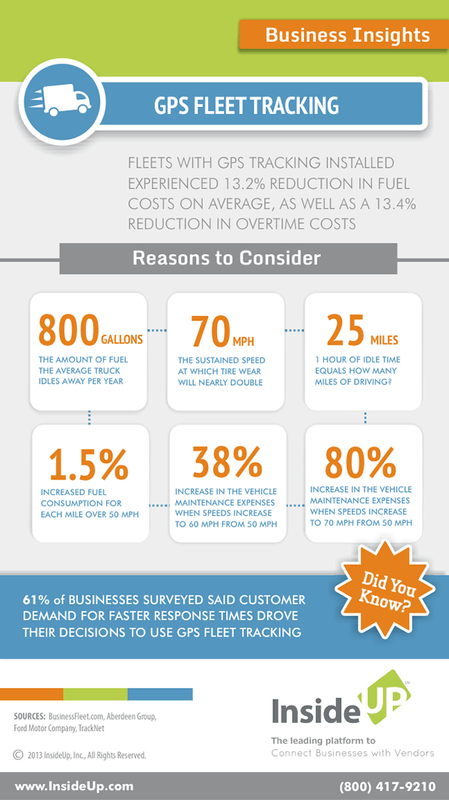 38% Increase in the vehicle maintenance expenses when speeds increase to 60 MPH from 50 MPH. 80% Increase in the vehicle maintenance expenses when speeds increase to 70 MPH from 50 MPH. 61% of Businesses surveyed said customer demand for faster response times dove their decisions to use GPS Fleet Tracking. Sources: BusinessFleet.com, Averdeen Group, Ford Motor Company, TrackNet.